Stylish comfort invites your guests to relax and stay a little longer. 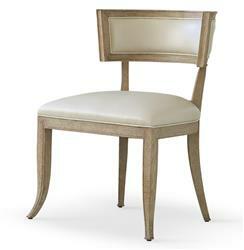 Supple beige cowhide covers the firm seat and back cushions, complementing the natural wood finish of the classic frame. At the dining room table or in a cozy corner, this is the best seat in the house.